The documents relative to the 19th century permit to consider closely what kind of studies and what kind of didactic activity were practiced in the Gabinetto di Fisica. One might say that with Magherini and Serpieri the teaching was carried out according to the highest educational concept in general, even though this concept was much affected by the pedagogical methods and the basic culture of the ecclestical world of that time. This statement should not be intended in a negative way; one cannot forget that over the 19th century the actual "guardians" of science were mainly the higher education institutions (which were often run by ecclesiastics) and the Seminaries: the contribution of the Barnabites, Piarists and Jesuits to the scientific debate, their movements and, consequently, their meetings for not only religious but also cultural and scientific reasons (efficient antidote againt the provincialism that was typical of many academic institutions of the time) bears evidence of an intellectual fervour that probably represents the real pillar of the Italian science in the 19th century. Yet, the approach to science suffered from an intrinsecally limiting attitude, which did not permit to see the scientific knowledge as a "step forward" to the knowledge of the "world". 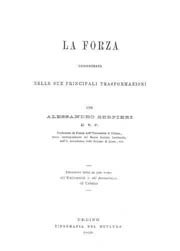 In this context it must be said that in 1816, under Pious VI's pontificate, the professorship of Sacred Physics, held by abbé Feliciano Scarpellini, was set up in the Roman "Archiginnasio". In the letter in which the Secretary of State, Cardinal Consalvi, appointed Scarpellini for the post, there are clear traces of the new attitude of the Church towards science: this is no longer seen as an enemy, as a challenge to inspired knowledge, but as an useful instrument to reveal the greatness of the universe, which is the manifestation of God. Science is, therefore, deprived of any implicit methaphysics, not to increase its intrinsecal theoretical value, but to turn it into a loyal instrument (and therefore clearly not neutral). This attitude had the noticeable result of allowing a sincere development in the scientifical studies, but their extent was greatly reduced so that the Italian scientific world (mostly ecclestiastical or anyway of catholic inspiration) was excluded from the fundamental debates that would later emerge after the passage from Classical Physics to Relativity and to Quantum Mechanics. 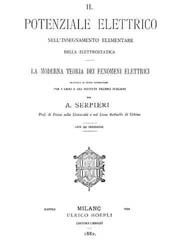 All these aspects are clearly present in Urbino in the development of the teaching of Physics promoted by Serpieri's great personality: during his research he approached the object of his study with the same amazement as of someone discovering an intimate harmony he can at first just perceive and then, by means of the reason, try to understand more deeply and consequently explain to the others so that they can take some advantage from it and be able to appreciate its deep interior greatness. This concept of "useful" science able to give us the tools to better understand (even ethically) our world, was clearly transmitted to his students in his main didactic works: "Il Potenziale elettrico"; "Le Misure assolute"; "La forza considerata nelle sue principali trasformazioni", which are real jewels in which the depth of his thoughts, his absolute mastery of the subject, his high concept of an educator come into light. The attention towards the disciple in order to make him actively participate in the process of knowledge of Nature and of its laws was also clear in the accuracy he had in introducing his students to the practice in the laboratory. 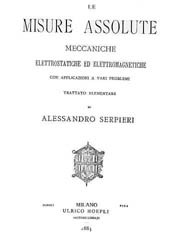 Although the structures did not allow much activity in this sense, Serpieri strongly committed himself so that the Gabinetto di Fisica could continuously permit to carry out didactic experiments. It is, however, true that they were more "class-room experiments" rather than a series of experiments (even simple) assigned to the students; yet, the link to the experiments was, however, an integrating part of Serpieri's didactics. After 1884, the tendency to reduce the scientific schools in the small universities as a result of both a general political choice of the Unitary State and of the objective local economic problems, drastically decreased the importance of the scientific laboratories of the University of Urbino. This is also reflected in the didactic activity: the role of a scientist- educator who, though as a professor, has a deep contact with the disciple, did not exist any longer and was replaced by a more detached educator whose didactic activity might have been maybe more efficient but undoubtedly less effective. From various documents it is evident that Martinotti, Rovida, and Fiorentino followed more or less Serpieri's curricula, using the same textbook (Carlo Matteucci, Lezioni di Fisica); there is no trace of great innovations introduced by them, but, above all, unlike for Serpieri, there is no official or personal recording about their relations with the students, about the life at school, about the laboratory's activities except for some written complaints about the permanent shortage of financial means that made the experimental activity nearly impossible. The noticeable decrease in the number of students (there were sometimes just few students for any single course of the School of Pharmacy) however permitted to assign to each of them a great number of experiments he had to carry out on his own, and, at least from this point of view, a relatively modern approach was adopted in the didactic activity; unfortunately, there is no information about what kind of and how many experiments were actually made during the year. "La Forza considerata nelle sue principali trasformazioni"